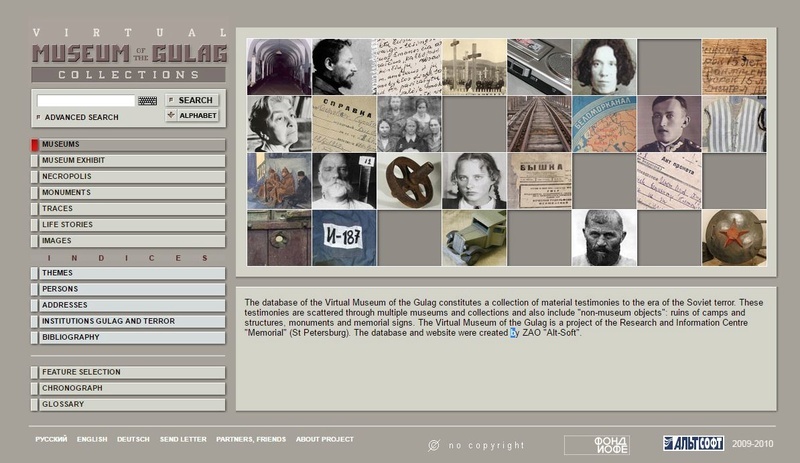 The database of the Virtual Museum of the Gulag constitutes a collection of material testimonies to the era of the Soviet terror. These testimonies are scattered through multiple museums and collections and also include "non-museum objects": ruins of camps and structures, monuments and memorial signs. The Virtual Museum of the Gulag is a project of the Research and Information Centre "Memorial" (St Petersburg). The database and website were created by ZAO "Alt-Soft".